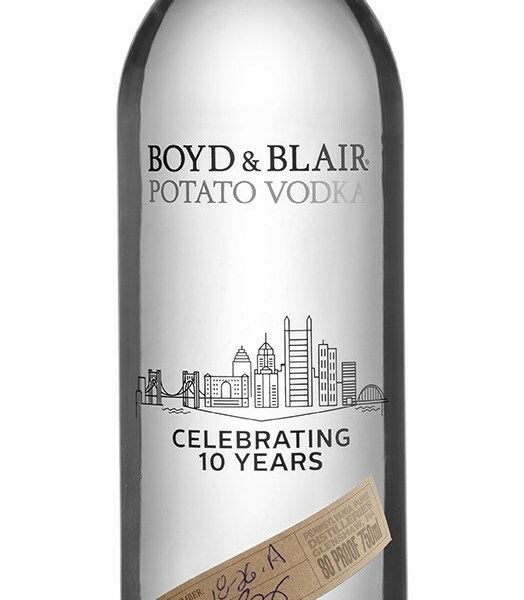 Pennsylvania Pure Distilleries have announced the 10th Anniversary of its Boyd & Blair Potato Vodka. In commemoration of this milestone, the distillery has released limited edition 10th Anniversary bottles paying homage to the Pittsburgh skyline and celebrating the birthplace of the craft spirit. Launched in 2008, Pennsylvania Pure Distilleries was only the second distillery to open in Pennsylvania since Prohibition, and Boyd & Blair Potato Vodka was one of the first hand-distilled potato vodkas in the country. Over the past decade, the spirit has greatly expanded its reach and is now available in more than 2,300 upscale cocktail lounges, liquor stores and fine restaurants. It is currently sold in 41 states, plus Singapore, Hong Kong, Alberta Canada and France. "Ten years ago the words "artisan" and "vodka" didn't really coincide in the world of spirits," said Barry Young, cofounder and Master Distiller of Pennsylvania Pure Distilleries. "I wanted to fill that void and develop a vodka that could be sipped on the rocks or even neat, and had enough flavor for a whiskey drinker like myself to enjoy. Since then, the craft distilling landscape has evolved, and we're proud to still count ourselves among the country's first and few authentic artisan distillers." "Maintaining consistency of flavor has always been important to us, and one way we have been able to accomplish this is by sourcing our ingredients from the same local farms as we did on the day we started," said Young. "We are privileged to work with local farmers who value the quality of their products as much as we do our spirits." Boyd & Blair Potato Vodka is distilled from local PA potatoes from which Young unlocks natural sweetness by fermenting with champagne yeast. Adhering to a 100% hand-crafted method results in an absolutely masterful spirit that redefines the label "vodka" by rewarding the senses with a smooth, creamy, semi-sweet flavor and no harsh "bite." "Hitting a home run with Boyd & Blair was incredible, but seeing the same pattern of success taking shape with BLY Rum is such an unbelievable feeling," said Young. "Developing a new spirit takes a significant amount of time and patience, and to stay true to our mission I also resist the temptation to make a portfolio of spirits. At the end of the day I want to be known for putting out the best spirits, and if that is just a few I am very proud of that. For me it will always be quality over quantity. 'Just because I can make anything does not mean that I should,' has always been one of my mantras"
Pennsylvania Pure Distilleries is open to the public for free tours and tastings on Saturdays only. For more information, please visit, http://boydandblair.com.